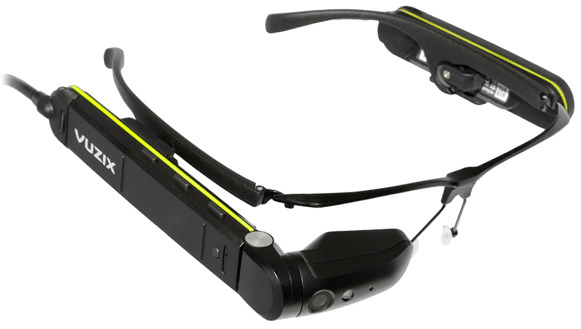 The Vuzix M300 Smart Glasses is an ergonomically designed and rugged Android-based wearable computer. It’s enhanced with a monocular display and onboard processor, expandable memory, recording features and wireless connectivity capabilities. And it’s been purpose-designed for enterprise, professional, and prosumer users. Pre-installed apps can be used to track timed events, manage your calendar, and link to your phone and more. The HD camera records, stores, plays back still pictures and video, and can be used as a bar code scanner. The M300 is compatible with thousands of existing Android apps and Vuzix’ easy access to developer resources enables the creation of custom apps to suit virtually any need. Vuzix M300 provides most of the features and capabilities of a modern smartphone, in a hands-free wearable device. Bluetooth 4.0 connectivity makes it ideal to pair with Android devices or connect wirelessly with Wi-Fi to the Internet. An integrated head tracking provide apps with angle of your current view for unprecedented situational awareness. Voice, button press, and touch pad with gesture controls, and ruggedized against water, dust, and dirt give the user versatility to navigate and use the M300 in almost any working environment. Also includes the flexibility of enhanced battery packs for long/high intensity users and lightweight batteries for low/infrequent users. The M300 is an updated design with enhanced functionality and wearability to follow on the popular Vuzix M100.